Find t-shirts, action figures, comic books, costumes and other gear for all of your favorite heroes from the Marvel Universe, from Iron Man, Captain America and Thor of the Avengers More... to Guardians of the Galaxy, the Fantastic Four and X-Men. Lots of cool toys and products to choose from with your favorite superhero characters. Satisfy your inner geek and browse our thousands of Marvel related merchandise. Great gifts here for Marvel fans and collectors. She-Hulk is a comic book character from Marvel. The story goes that Jennifer Walters received a blood transfusion from her cousin Bruce Banner which left her with some new Hulk-like personality and physical traits. The character retains much more control over herself than Hulk traditionally has. Jennifer Walters is a lawyer by day, green beast by necessity. Here are some novelty t-shirts featuring this awesome female hero character. Get ready for Endgame and surround yourself with the Avengers with these awesome life size* standup cardboard cutouts from Infinity War. These are vibrant full color realistic printed cardboard cutouts that you can stand up, self-supported, in your living room, around your tv, or by the front door to deter villians and protect yourself from Thanos and his ilk. The Vitruvian Man illustration by Leonardo da Vinci is a famous drawing from the Renaissance. It is also known as the Proportions of Man. The ink drawing is based on ideal human body proportions and shows a naked man in two superimposed positions. The famous art piece demostrates a blending of math with art. This design is often spoofed or copied using different characters. Here we have found some Marvel character Vitruvian Man designs on t-shirts. Play some old-fashioned Monopoly board game fun with a twist! These editions are all infused with awsome Marvel hero and villain characters, places, and more. Pick up an officially licensed Marvel Monopoly game of your choice -- and there are some to choose from! 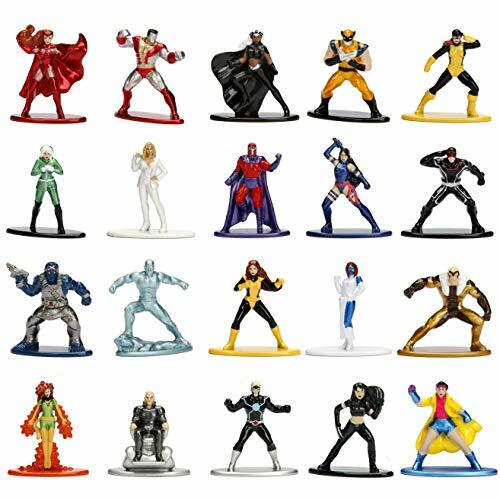 This is a fun pack of 20 different Marvel X-Men character figures. The 1.65" scale metal figures are die cast and colored with premium metallic paints. With this big X-Men figure set you'll get all of your favorite characters, posed in action stances, ready for battle. The figures include Rogue, Colossus, Storm, Wolverine, Mystique, and Professor X. The small vibrant figures from Nano Metalfigs are perfect for play or collectible display!